Sunrise Volunteers gave Christmas gifts to Sunrise residents and daycare clients. In the past, T-shirts were gifted as a way of cheering up the residents. This past Christmas, we gave T-shirts with the writing, “We are Sunrise.” Residents enjoy and wear these shirts all year long. In order to fund these and other gifts for residents, we have a fundraiser or two throughout the year. This year we plan to have a few fundraisers and we welcome your support. 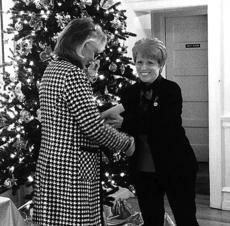 Debbie Skaggs was installed in December as president of The Garden Club of Elizabethtown by the Garden Club of Kentucky President, Joann Kirby of Lancaster. Skaggs has a large flower garden but said having a garden is not a requirement to be a member of the club; you just need to be interested in gardening and related topics. I pledge my head to clearer thinking, my heart to greater loyalty, my hands to larger service, and my health to better living, for my club, my community, my country and my world. Three local women will become members of the Captain Jacob VanMeter Chapter National Society of the Daughters of the American Revolution at noon on Friday, Dec. 19, at the Brown Pusey House in Elizabethtown. 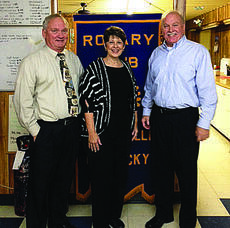 The new members’ ceremony will welcome Nancy B. Raine, Betsy Tucker and Cynthia Carter of Hodgenville. On behalf of the Sunrise Manor volunteers, I would like to wish everyone in our community a very merry Christmas and a happy New Year. This is the time of year we celebrate Jesus Christ’s birthday and look forward to happiness and joyfulness in the coming year that he will provide. Tim Shockley, a Sunrise Manor chaplain, is organizing a Sunrise Manor choir. 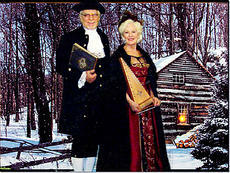 The choir’s first presentation will take place Dec. 22 at 6:30 p.m. on the second floor of Sunrise Manor. 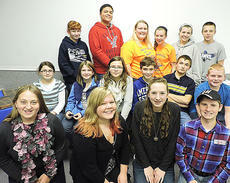 Several 4-H members and volunteers were recognized at the annual 4-H awards banquet. 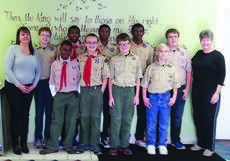 The outstanding members for 2014 were named, based on points earned through 4-H activities. The Junior Division includes 4-H members who are 9-13; the Senior Division includes members who are 14-18. Michaela Rock was the Outstanding Senior 4-H Member Silver Level; Lexi Grimes was the Outstanding Junior Member Bronze Level. Three local ladies will become members of the Captain Jacob VanMeter Chapter National Society of the Daughters of the American Revolution at noon on Friday, Dec. 19, at the Brown Pusey House in Elizabethtown. Don and Glenda Patterson and Lorinda Jones will present a program in their series, West of the Alleghenies, “Christmas in the Colonies”.